My sister-in-law who just arrived yesterday afternoon from the haj saved for me a Saudi Arabia 500 Riyal issued this year. This 500 Riyal shows the Masjidil Haram and the Kaabah. I finally got my hands on the first issuance of the new Malaysian $50 note thanks to my uncle in Kuala Lumpur. He bought it on the 26th, pos laju it to me and on the 29th, I got it! According to my Australian friend, this issue sold out within 4 hours. And Pa Uchu Mud, thanks so much for taking the time to buy this for me all the way from KL. I am still studying the note but I thought I will share the image of my new note to everyone out there in the world. I am not sure what the difference is with this new special issuance other than it comes in a nice pack with the circulation note which will come out in mid January 2008. In the meantime enjoy! SIGNIFICANCE OF ISSUE This new design RM50 banknote is issued to commemorate the 50th Anniversary of Malaysia's Independence Day which took place on 31 August 1957. This banknote captures the birth of Malaysia as a constitutional monarchy, its rich cultural heritage and the success of its economic development. FRONT The design motifs on the front side feature the portrait of the first Seri Paduka Baginda Yang di-Pertuan Agong, Tuanku Abdul Rahman, on the rigan and the national flower hibiscus on the centre. Design patterns from songket weaving, which are in the background and edges of the banknote, reflect tradtional Malaysian textile handicraft and embroidery. Incorporating the latest security features, the multicolour latent image of the denomination 50 can be seen when the banknote is tilted slightly and the colour changes when it is rotated. The holographic stripe features the denomination 50 and the hibiscus flower, with a multicoloured pumping and matt-structure effect. BACK The design depicts Malaysia's economic transformation from agricultural to that of higher value-added manufacturing and services-based economy. Malaysia's first prime Minister, Tunku Abdul Rahman Putra Al-Haj, is capture in the historic declaration of Malaysia' independence. The logo of the 50th Anniversary of Independence is inspired by the national flag 'Jalur Gemilang'. The logo represents the nation's achivement since independence and symbolises the unity of the diverse ethnic groups living together. To mark this anniversary, Bank Negara Malaysia has commissioned the issuance of this new design RM50 banknote. Just to complete the Saudi Arabia 2007 currency series, here is the second of the 5 set series. This one is interesting as it shows the Dome of the Rock on the obverse and the Masjidil Aqsa Mosque in the reverse. Many people actually assumed the Dome of the Rock is the Masjidil Aqsa which is actually very wrong. The Masjidil Aqsa is besides the Dome of the Rock. I guess the Saudi Authorities chose this because they wanted to complete the three Islamic holy mosques. By the way, I was right. The 500 Riyal does have the photograph of the Masjidil Haram and the Kaabah. Soon I will get it as my brother in law who will be returning from haj has promised me that note. I read somewhere that the United States Postal Services took a vote from its special Star Wars stamps collection of which character deserves to be focused on. Yoda won hands down. 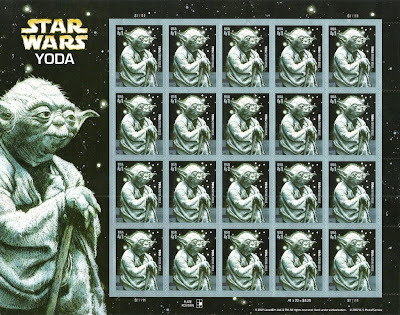 So the USPS complied and issued this special Yoda collection. It was issued towards the end of the third quarter this year. My sister just came back from her haj and I asked her to keep for me all the Saudi Riyals which are new this year. This is the 100 Riyal of the 2007 series. I was expecting a photo of the Kaabah in Mekah but this is Prophet's mosque in Medina. I am assuming that there is a 500 Riyal which will have the photo of the Kaabah. This is the $3 of the Antartica Notes. I wrote earlier about the $1 note. I still find this note even if it is technically not legal tender in the usual sense but people do do used it. The reverse is interesting. Just like some of the European currency, it is vertical. It's amazing what insomniacs can do. I used my 'unable to sleep' time to check and recheck my stamps collection. Armed with a magnifying glass and a $60 watermark reader, I checked almost all my Brunei collection. The early Brunei collections are crazy as there are so many colour changes and the only way to tell them apart is to check the watermark. Some watermarks are visible but some are next to useless. But if it was not for the watermarks, then it is very hard to tell when one stamp was produced when compared to another. What I managed to discover what that hidden among the spares are two stamps specifically issued in 1916 which was to complement the 1908 series. The 1916 had 2 colour changes, the first was the change of the 5cents from black and orange to full orange and the second was the change of the 5cents from blue or inidgo blue to ultramarine. However they kept the watermark the same which is Multiple Crown CA. Subsequent 5cents in 1924 and 1947 kept the same colour but the paper watermark is Multiple Script CA. Similarly for the 8cents stamp. How much are these worth then? The 5cents mint is about $70 and the 8cents is half that. Next I have to look at the 5cents label on the 5cents stamp. If I can prove that the 5cents was a retouch (someone in England when printing made a mistake with the 5cents label and printed the 5cents separately), then that piece would be worth $2,000.00. 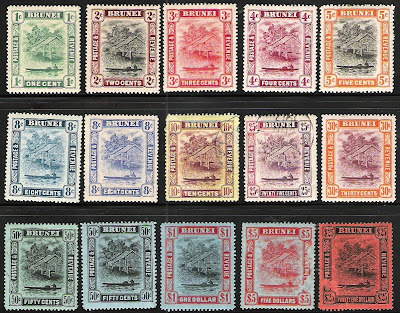 Most catalogs would place these two stamps as part of the 1908 collection, so the 1908 with all the various colour options would be around 16 stamps in total. I was at my uncle's a couple of nights ago looking through his collection. He had some of his own but when he was in the States, he managed to get the entire pre 1998 Brunei stamps collection. My uncle lent me that album during Hari Raya but I could only glance through it. A couple of nights ago, I took the opportunity to have a thorough outlook. What I realised was that I had some of the stamps which I thought was missing. So I spent a half hour searching through my spare stamps. And guess what? I really did have some of the missing stamps to complete my collection. And guess what for the second time? I have the entire 1908 stamp collection plus the colour changes from 1908 to 1916! Though this set is more common and the highest price I could get was only RM900 for the entire set. YES!!!!! It took me a few months but I finally managed to get the entire 1906 set. For this who do not know, the 1906 set is the very first official stamps issued by the Brunei postal authorities. 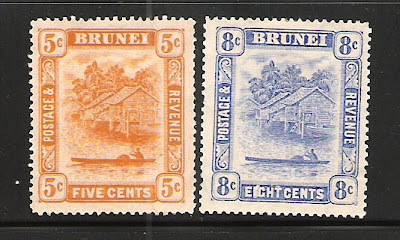 There was an early 1895 set which was done by a private entrepreneur who got the right to sell the stamps outside Brunei in exchange for running a postal service (it went defunct in about 1902/03). However not all philatelist accepted that as an official set as it was not done by the postal authorities. This particular collection is worth some RM$2,400 for mint and about a thousand more for used stamps. Up to yesterday, I had 10 of the 12 stamps. I could not find the 5c and $1 stamps. So when an entire set came up I had to purchase the entire set just to get the two missing stamps. I ended up paying about US$350 for the entire set. The difficulty is that this set was seen as a temporary replacement stamps for the ones which was issued in 1907. So only limited stamps were available. For instance the $1 stamp - only about 2,000 were printed. So trying to assemble the entire collection was very very hard. Sultan Hashim handed over the general administration of the State to a British Resident on 2nd January 1906. Plans were made for a complete postal service, with the official inauguration of this service on the 11th October 1906. New stamps were ordered from the Crown Agents and, pending their arrival, surplus stocks of the Labuan Crown issue were overprinted and surcharged by the Government Printers in Singapore. Iola, WI (November 30, 2007) -- United States paper money listings have been added to the NumisMaster online pricing and information service powered by Krause Publications. The up-to-date prices listed in the United States Paper Money Guide, available at www.numismaster.com, include: all non-coin monetary issues of the United States, including large-size, small-size, Fractional Currency, National Bank Notes, error notes, pre-Civil War Treasury notes, Silver and Gold Certificates, Military Payment Certificates, encased postage and postage stamp envelopes. Current market values are listed in up to four grades of preservation. In addition to the U.S. paper money price listings, NumisMaster offers more than 1 million price listings for U.S. and world coins. Other features include a show calendar, blogs, news, articles about collecting and expert advice. For more information visit www.numismaster.com. Krause Publications, based in Iola, Wis., is the world’s largest publisher of leisure-time periodicals and books on collectibles, sewing and quilting, hunting, and fishing. Chet Krause, a long-time collector of coins, published the first issue of Numismatic News on Oct. 13, 1952, with nearly 1,000 readers. Today, Krause Publications, owned by F+W Publications, offers over 40 periodicals, 10 hobby shows, 750 reference and how-to books, and web properties such as NumisMaster.com, the online coin price database. F+W Publications, and ARBY Partners, LLC Company, also operates book clubs, conferences, trade shows, interactive media and education programs.